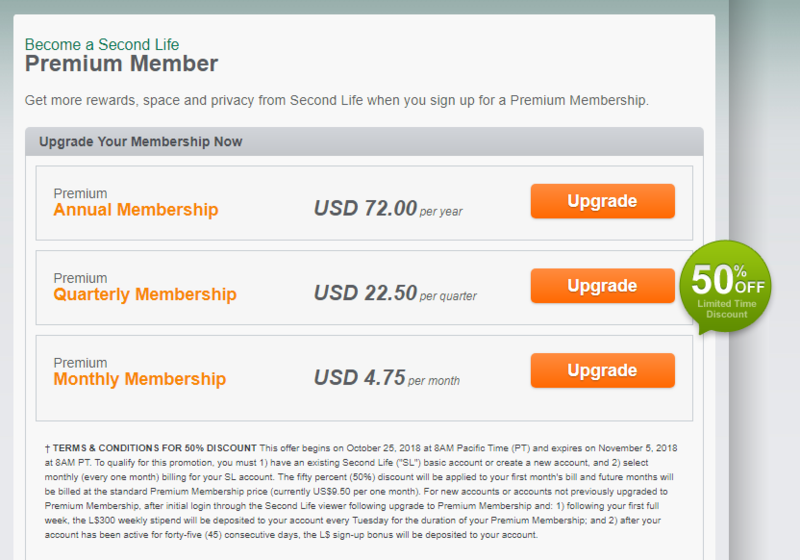 Within the past hour Linden Lab have announced an new exclusive promotional price of 50% off your first payment on a new monthly Premium Membership subscription. The offer started today at 8am PDT/SLT and will expire on 5th November 2018. Premium members will also receive a L$1000 sign-up bonus, a weekly L$300 stipend, exclusive access to Premium sandboxes, exclusive gifts, a personal home which has now expanded to 1024 instead of 512 and much more. Premium members receive a L$1000 sign-up bonus, a weekly L$ stipend, your own personal home (which is now 1024 instead of 512), and exclusive gifts like the current spook-tacular Haunted Campsite (pictured). As a Premium member, you also enjoy many other benefits, like exclusive access to Premium Sandboxes inworld (where you can create and meet other Premium members), priority access to crowded Regions and events, expanded customer support, and increased missed IM caps and group membership limits. This offer begins on October 25, 2018 at 8AM Pacific Time (PT) and expires on November 5, 2018 at 8AM PT. To qualify for this promotion, you must 1) have an existing Second Life (“SL”) basic account or create a new account, and 2) select monthly (every one month) billing for your SL account. The fifty percent (50%) discount will be applied to your first month’s bill and future months will be billed at the standard Premium Membership price (currently US$9.50 per one month). For new accounts or accounts not previously upgraded to Premium Membership, after initial login through the Second Life viewer following upgrade to Premium Membership and: 1) following your first full week, the L$300 weekly stipend will be deposited to your account every Tuesday for the duration of your Premium Membership; and 2) after your account has been active for forty-five (45) consecutive days, the L$ sign-up bonus will be deposited to your account. Will you be upgrading your account to Premium over the Halloween holidays ? Pingback: Second Life Newnesses! – Thar She Blows!